It is raining again this morning. And it rained for a while last night and yesterday and the night before that and the day before that. It feels like it has rained almost every day since our load of logs was delivered to us… and it actually has… last night the local weatherman said we have not had two consecutive days without some rain for the past seven weeks. 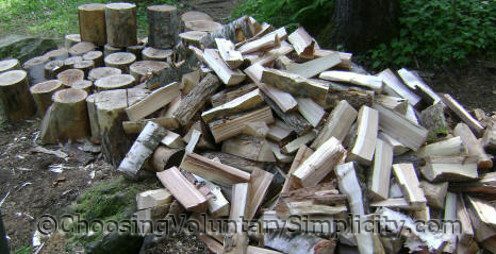 So we feel we have done fairly well despite so many rainy days, because we now have about six cords of the new firewood cut, split by hand, and stacked in our well-ventilated shed. The shed is full now because we already had some wood left from last year, but we plan to stack two more rows against the outside of the shed. Whatever amount of wood is left in the remaining logs will be cut and split and stacked somewhere outside to be burned another year. This is the pile of logs the way it looked yesterday afternoon just as it was starting to rain again. 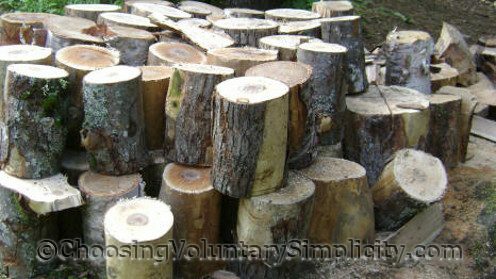 We’re not sure exactly how many logs are left… it is almost impossible to get an accurate count because of the way they are piled. We feel we have made good progress, especially with all the rain, but as you can see we are still far from being “done.” It was a BIG load! All that split wood! Wonderful! There is nothing like the security it brings to a long Maine winter. I used to split mine in the winter when I needed it (all the time) and come in to hot cocoa, a slice of pie and then back out to work. I always gave thanks to the trees who gave their life for my comfort. Thanks for the update, Shirley, on this huge project. I was wondering how it was coming along. I’ve been interested in this whole load of logs thing because my wife and I have been thinking about having one delivered next year. We’ve never been afraid of hard work but it seems like such a huge project. Thanks for the update, it helps put everything in perspective. We think we’re going to give it a try. We’ve been having almost constant rain too. The gardens are really suffering and nothing is growing on schedule. We have our firewood delivered by the cord and we’ve just had three loads in a row delivered in the pouring rain. Oh well, it will have plenty of time to dry before winter. Thanks for updating us. Your photos are great. Rain here too. We actually had 4 days of sun, with just scattered showers…but last night the spigot opened up again. Definitely not a good year for gardens, will be lucky if we get anything. I moved to MI from NH in 2007, bought an outdoor wood stove central boiler (great and heats all the water for my home and heats my greenhouse too) and finally my 99 year old Magee Oxford cook stove has been connected downstairs in the second kitchen (two weeks ago) and she is still in fine shape for her age. That truck load of wood that you are talking about is called a Pulpwood load here. I now have learned how use a chain saw, and work it so that I have 14 full cords for winter, then cut and stack it in my new woodshed by myself. Lot of work but so worth it. Cant wait to keep the old Magee going this winter for heat and normal cooking. Sometimes it drops to 40 below here.